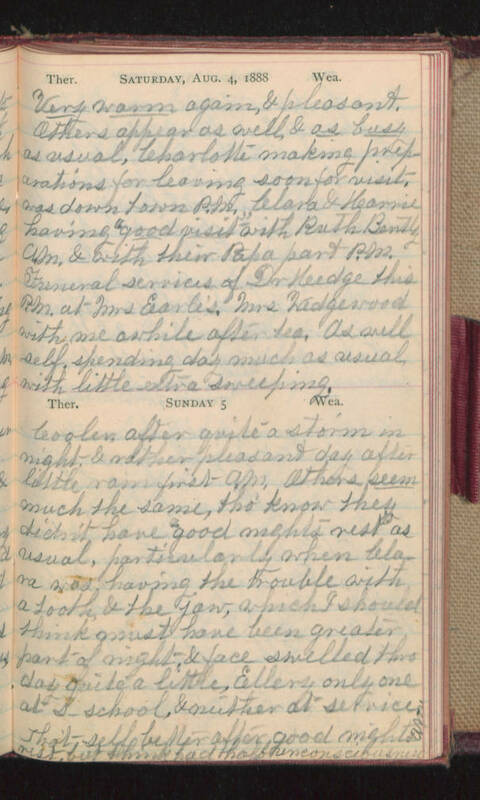 Saturday, Aug 4, 1888 Very warm again, & pleasant. Others appear as well & as busy as usual, Charlotte making preparations for leaving soon for visit. was down town P.M. Clara & Karrie having "good visit" with Ruth Bently A.M. & with their Papa part P.M. Funeral services of Dr Hedge this P.M. at Mrs Earle's. Mrs Wedgewood with me awhile after tea. As well self, spending day much as usual with little extra sweeping. Sunday 5 Cooler after quite a storm in night & rather pleasant day after little rain first A.M. Others seem much the same, tho' know they didn't have "good nights rest" as usual, particularly when Clara was having the trouble with a tooth & the jaw, which I should think must have been greater part of night & face swelled thro day quite a little, Ellery only one at s-school, & neither at service. That self better after good nights rest, but think had half unconsciousness A.M.